There have been lots of recipes floating around for seasonal spiced things as well, which always gets me into the holiday spirit. So I decided to give one a try, and of course put my own spin on it. 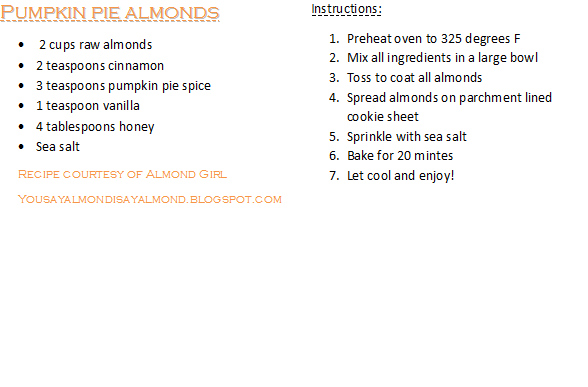 Since it is Halloween, I tried a pumpkin pie spice almond recipe and it does taste like I am eating a pumpkin pie! What I enjoyed about this recipe is that it is easy, has very simple and few ingredients and that it doesn't take long to prepare. So give it a try and let me know how you prefer to eat your almonds?